After attending a #fallcue session on sketchnoting, I embraced my budding artistic skills and began experimenting. In an effort to combine my work with touchscreen Chromebooks, I decided to use the Sketchpad app on an Acer R11 with a conference giveaway stylus pen. As you can see from my growing gallery of sketchnotes here, there are ongoing attempts at learning happening. One of my initial frustrations with sketchnoting was my inability to write words. Based upon several PLN conversations, I ended up changing to a mesh tip stylus. As you can see from the sketchnote in the top right corner of this post, my sketchnote writing was still a bit sketchy. @rockourworld suggested sketchnoting on a grid background layer to keep words and ideas level. 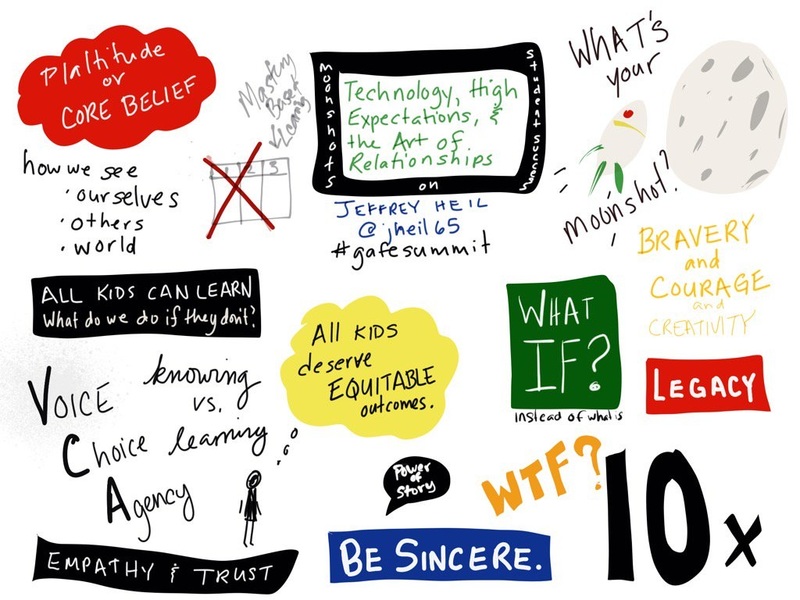 While comparing my efforts to @maoliver17's sketchnote of the same keynote (bottom right corner of this post), we discussed strategies for visual notetaking. In an attempt to resolve issue with writing words, I decided that I need use thicker lines. I had been too worried about using thin lines so that I could fit more information on a page. 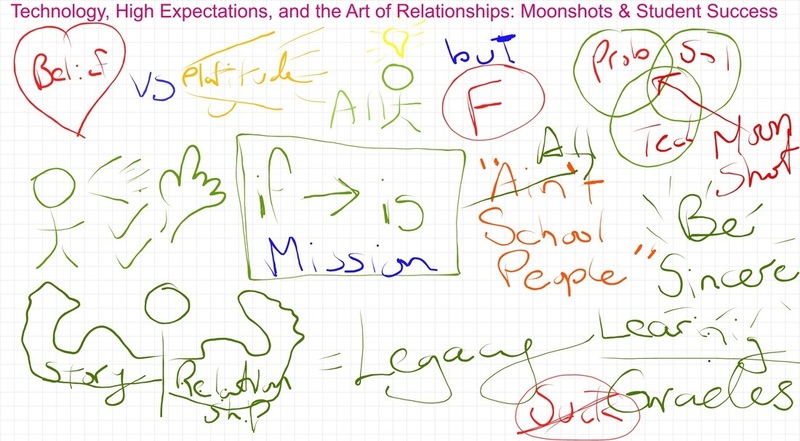 @maoliver17 also commented that visual notetaking has its own vocabulary. Developing the symbols and images to represent common words and ideas will take time to develop. It has been a busy couple of weeks FAILing. Although I am still exhausted, my neurons are still firing with ideas sparked from the 2016 Fall CUE Conference. I participated in an unconference session on Friday, and two concurrent sessions on Saturday. Heading into the conference, I had planned to attend sessions about coding and badging. There were plenty of sessions to attend, about these two topics. 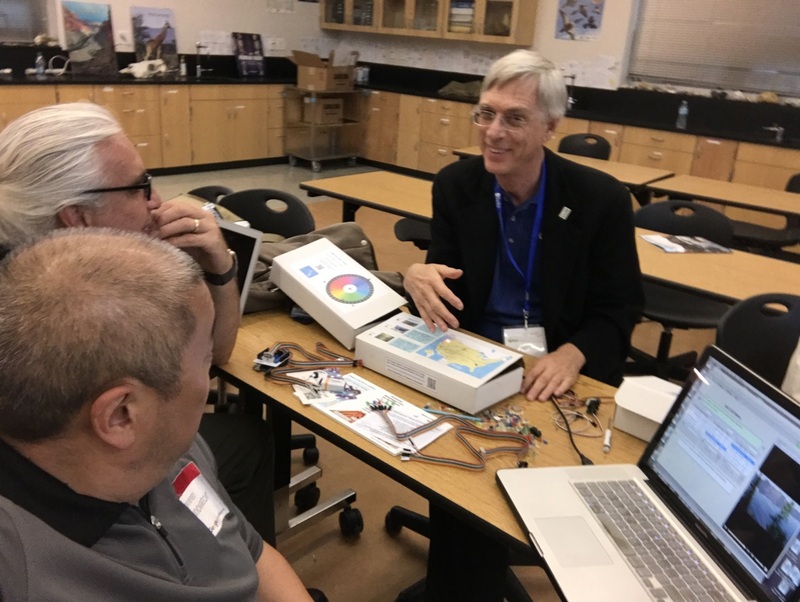 ​​On Friday, after the close of the last scheduled concurrent session, @johnpatten and I were treated to a unconference session about the Hyperduino from its creator, Roger Wagner. We discussed and explored the student learning activity possibilities of the hyperduino, mutimedia, and Chromebooks. Roger demonstrated several projects that are steeped in content while offering students the opportunity to practice problem-solving and coding skills. Before I could get to my seat in my first scheduled concurrent session for Saturday, I bumped into @CLipsig. We engaged in an EdCamp moment as she shared about her classroom's recently acquired Cozmo, including the homegrown funding model to acquire the robot. This conversation by listening to some great lesson ideas for Raspberry Pi. The Coding a Pi concurrent session covered all the basics of getting started with a Raspberry Pi along with links to some great coding ideas and student samples. My final session at the conference was a lesson on sketchnoting. These visual notes have always been great to look at, but I have avoided them because drawing is a talent that I have not developed yet. I appreciated that the session provided guidance on getting started (the five basic shapes plus the blog). The session also included some guided practice and some great curricular ideas for getting started. I am currently in the process of trying out touchscreen Chromebook apps for sketchnoting. Overall, I would say that I benefited from both the informal and formal conference sessions. The formal sessions piqued my interest in some new topics, while the informal sessions and discussions allowed me to further my knowledge in other areas. 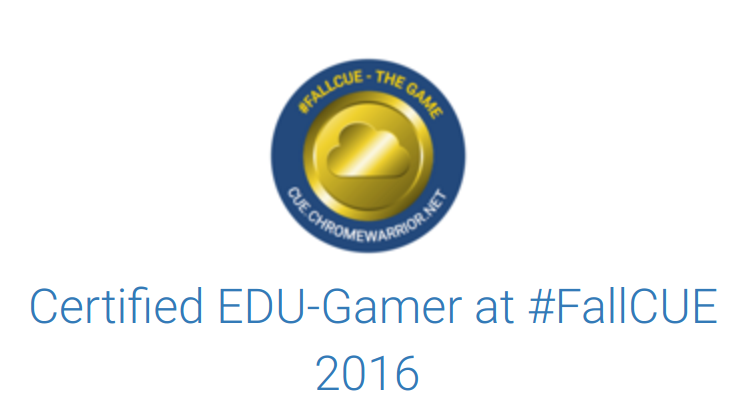 In addition, the FallCUE Game also prompted me to explore some new topics and set some learning goals for myself too. An important part of the learning process is reflection. I was fortunate enough to facilitate a few sessions at this weekend's Fall CUE Conference. This post will reflect on my my perceived impact and the areas in the presentations that I feel that I need to improve. The opening keynote was followed by a full day Google Workshop for Educators for beginner and intermediate users. In preparation for the workshop, I surveyed the attendees and developed both a website of resources and a series of classroom-style activities utilizing G Suite for Education tools. I felt that the activities were the right level for the workshop, but there was too much content. We did not cover all of the items on the agenda and people were definitely fatigued at the end of a long day. I am still trying to figure out how to avoid these types of issues during a six-hour workshop. ​My second session was a two-hour exploration of SAMR lesson design. I appreciate the the Fall CUE Conference has added a two-hour session as a format. I feel that it gives attendees a chance to spend some time exploring a topic or technology tool. I prepared a website that had an overview of SAMR and some examples of activities for each level of SAMR. However, after my session introduction that stated I would present for a short amount of time and provide guided work time, most of the attendees moved on to other sessions. I am left to wonder if I set the wrong expectations for my session or if I need to prepare to stand and deliver for the entire allotted time of the scheduled session. ​My presentations wrapped up with a Google Classroom session. I feel that I prepared a good agenda for intermediate Google Classroom practitioners. One of the tools that I wanted to demonstrate was Google Cast for Education. I asked the attendees to sign into my demonstration classroom, but due to the fact that they were taking notes in their own Google accounts, I instructed them to use Incognito Mode. This minor technicality was my session's undoing. The attendees' browsers could not see the Cast device that I had shared with the demonstration classroom. Since this was the crown jewel in my presentation, I ended up spending too much time trying to troubleshoot the technical glitch that prevented the demonstration from working. I have decided that for future presentations on this topic, I will bring a demonstration student device to give to a volunteer in the audience. This will help ensure that the demonstration will work. Overall, I feel that through my preparation for the sessions and from the questions from the audience, I have learned more about the topics. And I hope that the experiences from this weekend will make me a better presenter. However, I also feel that I missed some opportunities to learn from other conference presenters. Hopefully, at the next conference, I will find more time to attend sessions. 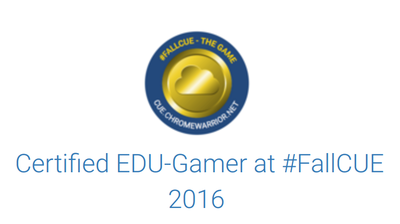 This blog is written by a lifelong learner, with a curious nature about all things edtech.